If you have been following our story, you already know that our walk has been a great success. We have uplifted and inspired people across the country, and brought our dogs to people in need of their unconditional loves and waggles. We have been blessed and watched over by our human family, and we WILL reach the Pacific – there is no doubt in my mind. This project has been funded by our own savings, as well as the many generous people who have helped us with meals, places to sleep, donations, and spreading the word about our cause. But despite our success, we are quickly running out of money. That is why we have launched a crowdfunding campaign on IndieGoGo.com. Our goal is to raise enough money to cover the remaining expense to get us through the last 3 months of this journey. We know that we will continue to meet generous people along the way. Reaching our funding goal will allow us to actually raise a surplus of funds, which we will donate to Pawsibilities Unleashed to support their mission of getting working dogs to the people who need them, and our favorite No-Kill animal rescue, Camelot Puppy Sanctuary. The only way our campaign will gain traction and get wider exposure is if we can build some momentum through donations, comments, and people spreading the word far and wide. That is why we need YOU – the friends, family, and strangers who already know about us – to help get this campaign going. We hate money. We hate worrying about it, and we REALLY hate asking for it. But this is the deal: If you believe that our walk is valuable, that our work to raise awareness for pet therapy and animal rescue has a positive impact and is worth supporting, please donate what you can today. Even if you have already donated (thank you!) or aren’t able to right now, please post a link everywhere you can, email all your co-workers – just help us spread the word. We feel so passionate about the Walk and our mission, but we couldn’t have made it this far without you. Thank you for reading, for caring, for moving over when you pass us on the street, for waving and smiling, for letting us into your homes and communities, and for supporting this project. Help Fund the Dog Walk! This entry was posted in Uncategorized and tagged across, america, animal rescue, dog, indiegogo, pet therapy, therapy dog, walk. Bookmark the permalink. 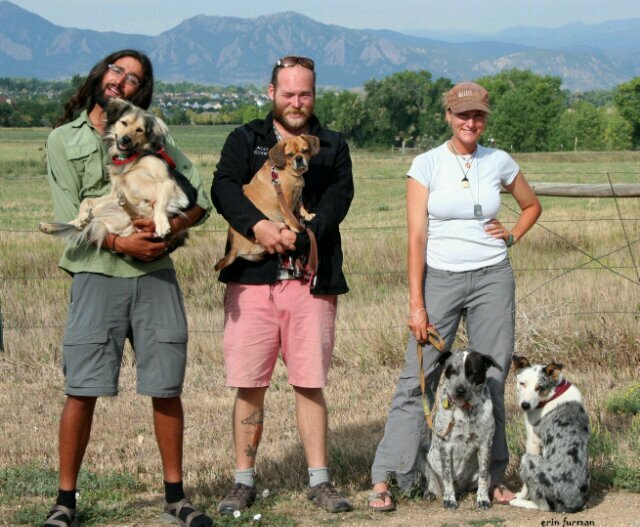 4 Responses to The Dog Walk Needs YOUR Help! Love those dogs, and their human companions — so proud of the entire entourage. Hi, guys. I just shared your campaign on my facebook and twitter pages. I also donated $5 to your paypal donate button on this page directly. Since I can’t afford much, I didn’t a chunk of it to it go away from Indiegogo percentage fees. Good luck on your campaign!! I really hope you make your goal! Awesome! I am going to share your page again with as many people as I can.. you are such an inspiration.. I love what you are doing. Colorado is an incredibly beautiful state. Mountains inspire me as well, and there is something so incredible and spiritual about them.